In 1993 a group of Northampton citizens called a meeting following the police beating of Rodney King in Los Angeles to talk about how this community could further ideas of racial equality and justice for all citizens. 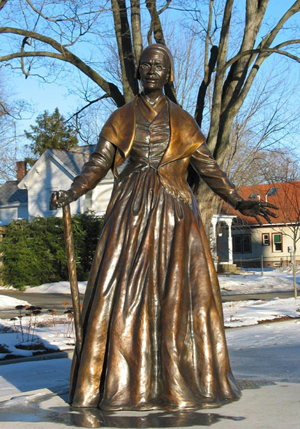 They decided on two goals: to create a symbol of the community’s desire to help eliminate racism and challenge oppression in our society, and to honor Sojourner Truth as that symbol because she lived in Florence, MA in the 19th century and her life work was to end racism and promote equality in our country. 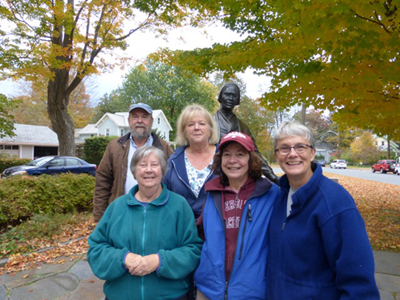 This group became the Sojourner Truth Memorial Committee. From 1993-2002, the committee successfully campaigned and raised money for the installation of a Sojourner Truth statue in Florence to honor her legacy. They then selected the site, raised funds, commissioned a sculptor, and selected a contractor to construct the memorial site. The idea for a memorial statue that would honor Sojourner Truth was the first project of the Sojourner Truth Memorial Statue Committee. Sojourner Truth was born a slave named Isabella in upstate New York in 1797. She worked for a series of five masters while raising five children. When slavery ended in New York State in 1827, she settled in New York City. A deeply religious woman, Isabella took the name Sojourner Truth when God spoke to her. 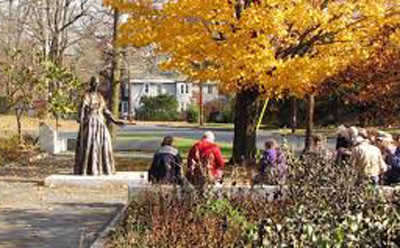 She was 46 years old when she set out walking and preaching through Long Island and Connecticut. Eventually she reached Massachusetts and joined the Northampton Association of Education and Industry. From her home here in what is now Florence, Truth broadened her mission and began speaking out for the abolition of slavery and for women’s rights. Wendy Sinton, a member of the park committee, contacted WMMGA last winter to request help in maintaining the garden, including pruning shrubs, and adding to the plantings. A group of interns under the supervision of MG Linda Bisaillon worked one morning a month on the garden. In the spring they planted columbine and fringed bleeding heart along with sweet alyssum and in the fall planted daffodils and species tulips. Sherry Wilson is the MG coordinator. In addition to the interns pictured here, Dottie Caron and Pat Krusko were faithful gardeners. Pictured here are Ed Geaughan, Sandy Graves, Gail Matthews, Cindy Brown and Sherry Wilson.